The worst years of my life were my teens, and a very large part of that was knowing nobody at my school would support me being transgender. I was absolutely terrified of anybody finding out the truth. On the very rare occasions trans people were mentioned in the media, they were punchlines, killers or corpses. I was certain nobody would treat my truth as valid. The people around me didn’t even have a frame of reference for what transgender meant, never mind an understanding of how painful and difficult being trans actually was. More than anything, I wanted to be myself. I longed to use my real name, wear the right clothes and be recognized as me. But I kept that desire buried deep, only sharing it with the tiny collective of other trans teenagers I had found online. Together, we were all miserable. Suicide was a constant specter among our group — a simple answer and easy escape from the daily anguish. When members of our community vanished, we feared the worst, dreading that their parents found out and the reaction had been too much. We lived on a constant tightrope. It was a battle to balance the secret stress of being transgender and the rest of the baggage that came from being an atypical teenager. In their most vulnerable and difficult stage of life, trans kids are not just facing opposition from their peers, but from the government, from society itself. At school, I was grouped with the wrong gender against my will, twice a week pushed into a male changing room. It was suffocating. The dysphoria I felt upon being forced into ill-fitting clothes and having the wrong name barked at me was only dwarfed by the horror of my own body changing around me. Puberty is a nightmare for a trans person. Your body is a prison that becomes more hellish every day, moving you further and further away from where you want to be. When I finally started my transition, many years later, as an adult, I took comfort in knowing that the next generation of trans kids could avoid what we had been through. 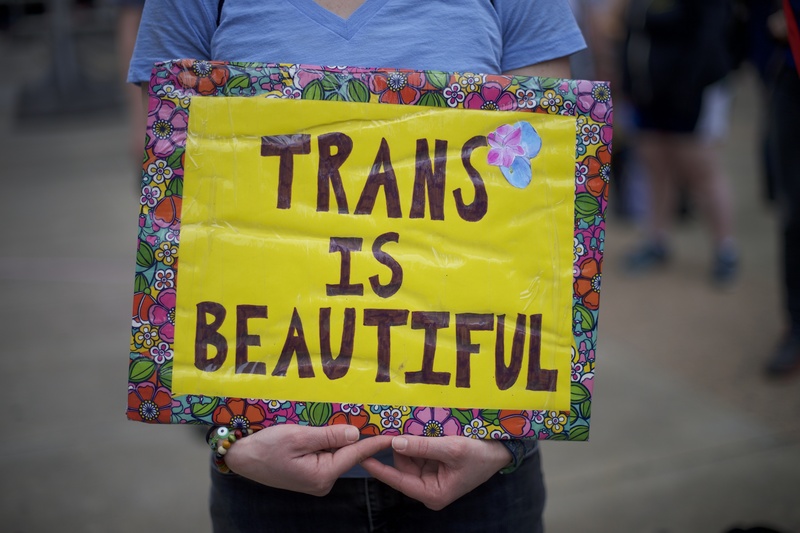 Thanks to the internet and increased visibility, transgender acceptance was growing. We’d hit the so-called “transgender tipping point,” after all. I thought we’d finally taken steps towards creating safe schools for transgender pupils, environments where children can feel supported, safe and begin their transition in peace. But I now know that’s not true. Trump’s government is openly hostile to transgender children, and school bathroom protections have been rolled back. This intolerance is bleeding outside of the US, as other politicians question whether trans people should exist in public or not. We’re not going backwards; we’re entering uncharted territory. Trans children are having their validity and human rights stripped away by the United States government. It is a devastating blow and a terrifyingly twisted message, one that insists that being transgender isn’t just a taboo — it’s wrong, dangerous to others. By denying the right of transgender kids to use the correct bathroom, they’re being told that their gender is a delusion. They’re hearing that they can identify how they like, but they better learn to keep their head down and stay out of public spaces. That is a horrific weight to drop onto a child. It’s not just about public pressure to reverse this change — it’s about showing trans kids that they’re not alone, that they’re not wrong. In their most vulnerable and difficult stage of life, trans kids are not just facing opposition from their peers, but from the government, from society itself. This move reversing bathroom rights isn’t an isolated incident; what was ignorance in previous years is now outright hate. Sensationalist news stories are running all across the media, spreading misinformation and lies about trans people, positioning us as unstable or perverse. Whether trans people should be accepted or not has become a topic considered debatable. It’s not hyperbole to say that if this momentum is not stopped, it will kill people. The suicide attempt rate for transgender teens is over 40 percent. Being true to themselves is often the only answer trans kids have; not doing so is unimaginable. But what’s happening right now is a targeted attempt to erase transgender people from society, and it’s harder than ever for these kids to be visible, to live. The last generation of trans kids had to go it alone, but you can ensure this generation doesn’t. We need to counter this. Cis or trans, you have a duty to stand up and shout that this is wrong. It’s not just about public pressure to reverse this change — it’s about showing trans kids that they’re not alone, that they’re not wrong. It doesn’t matter how big or small your platform is, speak up. Make noise and show trans kids that they have a future. There are children who are waking up terrified, wondering when this assault on their identity will end. They need to know you have their back. That although things are getting worse, you care about them, you’ll protect them and you’ll listen to them. Support at a time like this can be a lifeline. If any trans youth come across this article and want somebody to talk to, please feel free reach out to me via Twitter. I’m more than happy to talk. I used to be you, so I can promise that it does get better and that you are not alone. If you’re in the US or Canada and need someone to talk to, you can contact Trans Lifeline. If you’re in the UK, contact Mermaids.